Pi Mai Lao - Lao New Year, is often referred to as the most popular cultural festival in Luang Prabang and it's just around the corner! Festivities will kick off from April 10th and finish on the 20th. Parades take place on the main street, start from Wat That Noy until the end of peninsular and on the Mekong street. 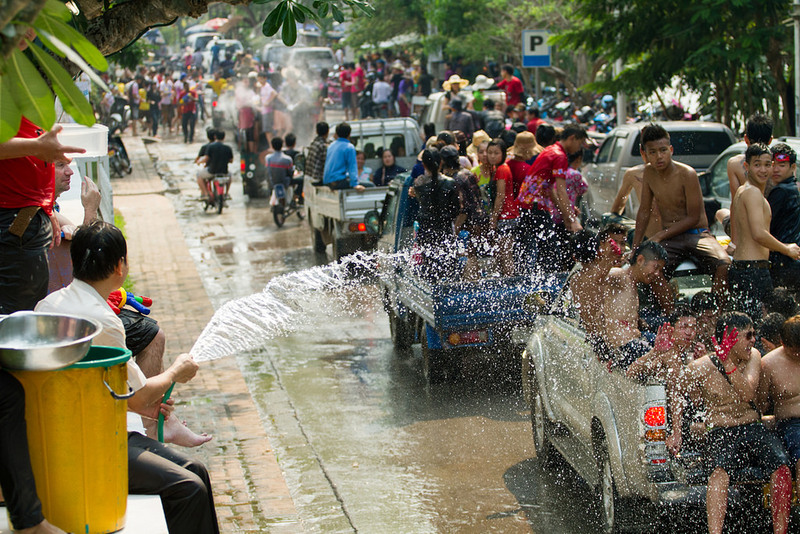 The moving of Prabang and Grand parade that run over the week and there are many reasons why it’s a festival ‘not to be missed’! 08:30 Opening Market & Fun fair at Thad Luang Ground (the old stadium). 09:00 LuangPrabang Traditional Sport Match at Thad Luang Ground (the old stadium). 19:30 – 23:00 Beauty contest for Nang Sangkhan (Miss Lao New Year) and Lao traditional dance and music at Thad Luang Ground (the old stadium). 09:00 Elephant procession named “Chang Hieng Koei” starts from Wat Mai to Wat Xiengthong. 06:00 Market Fair “Lolat” will be set up on the main street between the old stadium to the National Museum (the Royal Palace). The fair includes a traditional textiles show, local and bordering country’s products. 09:00 The ceremony of watering the Buddha images for blessing at every temple in LuangPrabang. 13:00 Gathering on the beach to make sand stupas “Toppathatsay” to bring a good luck. Baci ceremony at the sand stupas, traditional cultural performance, local sport match, Dragon Fire Rocket and sightseeing at “Hatsay moungkhoun” (Mekong River beach, Xiengman village, Chomphet district). 19:00 The ceremony of watering the Buddha images for blessing at every temple in LuangPrabang. 08:00 - Textile Exhibition at Ban Phanom, a traditional of Tailue ethnic group and followed by Baci ceremony for Leaders, international and local guests. 14:00 - Opening Visit Laos Year 2018 in LuangPrabang Town. - Opening the procession of Lao New Year (Nang Sangkhan) at in front of the National Museum. The procession will be set up on the main street from Wat Thatnoy to Wat Xiengthong. 05:30 Morning Alms Giving ceremony “Sai Bat” at in front of Wat Sene Soukharam and the climbing of Phou Si mountain to pay respects. 14:00 the procession of Lao New Year (Nang Sangkhan) from Wat Xiengthon back to Wat Thatnoy. 19:00 Naga and Lantern parades comes down from Phou Si mountain to the pond inside the National Museum. Also see traditional dancing (Pha Lak & Pha Lam dancing, Giants, Monkeys and Nang Keo dancing) at the Museum. 09:00 Together with monks, provincial leaders, elderly people, International and local guests Bringing Buddha image “Prabang” out of Hor Prabang inside the National Museum to Wat Mai. 13:00 Provincial leaders, Miss Lao New Year and all guests will visit Pak Ou cave for watering of the Buddha image. In the evening The ceremony of watering the Buddha images “Prabang” for blessing and see traditional dancing (Pha Lak & Pha Lam dancing) at Wat Mai.